This was an extraordinary man. Karol Jozef Wojtyla was the Bishop of Rome for such a long time that I’m afraid that I had begun to take his existence for granted. What I hadn’t given much conscious thought to was the fact that I, a longtime Protestant who had grown up in a strict Catholic family, was never able to ignore this Pope like I might have been inclined to otherwise. I formally converted in 1976; Wojtyla was elected Pope in 1978, while I was still in my fire-breathing, Martin-Luther-spouting, Rome-has-no-authority-over-me phase. Yet by the time John Paul II made his historic homecoming to his native Poland the following year, it was impossible to deny that the man did have a certain authority over me. And this authority did not spring from his being the head of my church—he wasn’t—or the successor of the apostle Peter, a claim of the papacy that I had always found dubious. When John Paul II exhorted millions of his countrymen to “Be not afraid!” in the face of the gray minions of Wojciech Jaruzelski’s communist state and the ruin it had made of Poland, it felt like the beginning of the end of something. Which, of course, it was. It was impossible not to admire a man who faced down tyranny not through political maneuvering or exegetical posturing à la liberation theology, but through the sheer force of his belief in the saving grace of Jesus Christ and its power to change lives. There was no craft or artifice in Karol Wojtyla, but there was a great deal of fire. And there was his doctrinal conservatism, for which John Paul II had always been excoriated (even during his visitation and funeral) by those on the left. No women priests. Abstinence, not condoms, for AIDS-plagued Africa. No political office for priests. And most of all, no abortion or euthanasia. But Wojtyla was uninterested in remaking the Catholic church into an institution that would appeal to postmoderns—or, for that matter, to the reactionary forces on the right that pressured him to abandon Vatican II and return to the Latin Mass. I like to imagine, although I really don’t know, that John Paul considered the fate of the mainstream Protestant churches which had started going squishy-soft and trendy during the Sixties, following every fashionable political cause and watering down their doctrine, and contrasted them with the ever-growing Protestant Evangelical movement. Evangelicals stood for something; the mainstream, more and more, stood for pretty much whatever you wanted it to. And in a misguided attempt to attract postmoderns, the mainstream began to self-destruct. Not so the Roman Catholic Church. And much of this, over the past quarter-century, can be directly attributed to the firm guiding hand of Pope John Paul II. I did not always agree with John Paul II, not by any means. He aroused my ire most recently by opposing the Iraq war, and it was hard to understand how a pope who cared so deeply about the peoples oppressed by communism could apparently care so little about the Iraqis under Saddam Hussein. And he seemed to simply throw up his hands when confronted with the priestly pedophilia scandal—one of the gravest crises the Catholic church had ever faced—although by this time his health had declined to such an extent that he was barely able to function, much less effectively lead a church of a billion people. In point of fact, I even disagreed philosophically with John Paul’s refusal to ordain women, even if I have always worried that so many would-be female priests (and ministers, for that matter) are angry feminists with an agenda—and, in any event, as a non-Catholic it was hardly my place to comment on internal Catholic policy. But with this Pope, the pros so far outweighed the cons as to practically reduce them to trivialities. Here was a man who, along with Ronald Reagan and Margaret Thatcher, stared down the mightly colossus of communism until it blinked first, even after the KGB had tried to assassinate him; in fact, this merely had the effect of redoubling the Pontiff’s efforts. 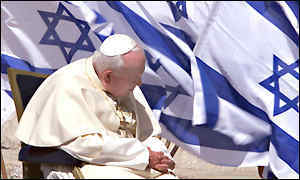 Here was a man who made it one of his foremost priorities to mend relations with the Jews, who established diplomatic relations with Israel and prayed at the Western Wall and gave anti-Semites the same withering staredown he had given communist dictators all over the world (this rapproachment with the Jews was also a remarkable lesson from John Paul to his own people, the Poles, who had never had much use for their own Jews). My father, a Catholic theologian, still marvels at the prodigious written output of this Pope and calls it “philosophical thinking of the first order.” And somehow, Karol Wojtyla still found time to master fifteen languages, to become an expert skier and mountaineer, and to travel the world many times over, not in the interests of politicking or pushing any personal agenda but to carry out what he had always thought was his primary mission: spreading the Gospel of Jesus Christ. I have marveled over the past few days since John Paul’s death at the outpouring of grief from Jews and evangelical Protestants, who act almost as if they had lost of of their own. Perhaps this is because, again, this Pope never really had an agenda of his own beyond doing his prayerful best to carry out the assignment God had put before him. And in this regard he saw all inhabitants of Earth in the same light, whether they were men or women, Jew or Christian or Muslim or Buddhist or Hindu, whether they were the leaders of powerful nations or untouchables in rural India; they were God’s children irregardless and John Paul seemed to hope most fervently that he could unite them all one day. Of course it never happened, but the passion and energy with which the Pope crisscrossed the globe underscored the urgency he felt in Jesus’ command, “Go ye therefore and teach all nations” (Matthew 28:19). If ever there was a Christian who truly walked the walk, it was Pope John Paul II. May he rest in peace. Lovely post. An amazing man, as much for what he did as for what he didn't have in doing it...no army, no WMD, and no huge resource base. Even a pagan like me can appreciate grit and sand. He had it. Thanks. I went through a real Catholic-bashing phase for about five or six years after my conversion, but I was unable to bash JPII. Which, in retrospect, says as much about the respect I had for the man as any of what I wrote here.